Once in a while a real gem appears. That “white whale” breaches the surface, giving me a glimpse that the never ending hope of finding that piece of a puzzle that completes the picture is still out there, somewhere, yet to be unturned. The joy that one small sliver of history wasn’t burned, thrown away or otherwise destroyed and has managed to be preserved for future generations. All my life I have been driven by the joy and nostalgia that I find while searching out old railroads and what the men who came before me did to create such massive wonders. Since the late 1990s the Georgetown Branch of the B&O RR has (obviously) been my primary interest. Thanks to a magnificent group of folks at the B&ORRHS and other places my research and excitement has been fed like a trail of breadcrumbs for an excited dog. But occasionally I find not a breadcrumb, but rather a meaty, marrow-filled bone. Today is one of those days. This photo, which comes from the wonderful Old Time DC Facebook page is one of those such bones. Shared by user Bill Ulle, he writes: “My great, great uncle, Louis Samuel Crown, left, around 1900, along Georgetown waterfront. Near present day Key Bridge.” Not only are photos of this area rare in this time frame, but seeing a steam loco up close is the “white whale” I spoke of earlier. Let’s break this down. 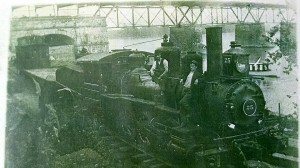 The photo was probably some time closer to 1908-1910 when the line was being built into Georgetown. The B&O had to enlarge the Northernmost arch of the Aqueduct Bridge to allow passage of freight traffic to pass beneath it and on into Georgetown. The OP says he has another photo showing his relative working on that. (Can’t wait to see it!!) Looking into W. Edson’s book Steam Locomotives of the Baltimore and Ohio (B & O): An All-Time Roster, we see that #25 is a class D-2 0-6-0, built Pittsburgh, 1887 (17″ x 24″ cylinders, 50” drivers, 79,700 pounds weight, 130 pounds) By 1915 it was off the roster. That means that it’s likely this photo was prior to 1915. Also note, the ties and trackwork look immaculate, as if it had very recently been laid. I would wager, that this photo captures the very earliest stage of the construction of the line into Georgetown. If you were able to go back in time and walk through the viewfinder, you’d look right and see a brand new track extending along a newly filled and formed waterfront area with boathouses appearing next to old mills and foundries along the riverside. If you looked out across the river, you’d see the bustling industry of Rosslyn, VA. To the left, you would walk under the arch under construction and on into Georgetown, where a myriad of ancient buildings, tall timber trestles with tall piles of coal surrounding their pilings, delivered from far away up the C&O Canal and being transloaded onto boats lining the docks. The waterfront was busy at this time, excited to have the railroad finally arrive. Another insult to the C&O canal its long history battling the B&O since day one (literally). Now THIS is a wicked cool find! !